According to Hersh’s sources, the normal “deconfliction” process was followed before the April 4 strike. In such procedures, U.S. and Russian officers supply one another with advance details of airstrikes, such as target coordinates, to avoid accidental confrontations among the warplanes crisscrossing Syria. Russia and Syrian Air Force officers gave details of the flight path to and from Khan Sheikhoun in English, Hersh reported. The target was a two-story cinderblock building in which senior leaders – “high-value targets” – of the two jihadist groups controlling the town were about to hold a meeting. Because of the perceived importance of the mission, the Russians took the unusual step of giving the Syrian air force a GPS-guided bomb to do the job, but the explosives were conventional, not chemical, Hersh reported. “A Bomb Damage Assessment by the U.S. military later determined that the heat and force of the 500-pound Syrian bomb triggered a series of secondary explosions that could have generated a huge toxic cloud that began to spread over the town, formed by the release of fertilizers, disinfectants, and other goods stored in the basement, its effect magnified by the dense morning air, which trapped the fumes close to the ground. Due to the fog of war, which is made denser by the fact that jihadists associated with Al Qaeda control the area, many of the details of the incident were unclear on that day and remain so still. No independent on-the-ground investigation has taken place. But there were other reasons to doubt Syrian guilt, including the implausibility of Syrian President Bashar al-Assad choosing that time – while his forces were making dramatic strides in finally defeating the jihadists and immediately after the Trump administration had indicated it had reversed President Obama’s “regime change” policy in Syria – to launch a sarin attack, which was sure to outrage the world and likely draw U.S. retaliation. However, logic was brushed aside after local “activists,” including some closely tied to the jihadists, quickly uploaded all manner of images onto social media, showing dead and dying children and other victims said to be suffering from sarin nerve gas. 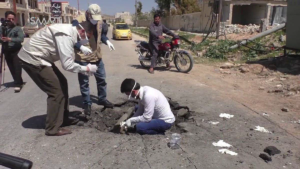 Inconsistencies were brushed aside – such as the “eyewitness” who insisted, “We could smell it from 500 meters away” when sarin is odorless. Still, whether credible or not, these social-media images had a potent propaganda effect. 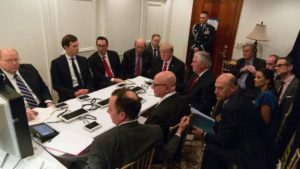 Hersh writes that within hours of watching the gruesome photos on TV – and before he had received any U.S. intelligence corroboration – Trump told his national security aides to plan retaliation against Syria. According to Hersh, it was an evidence-free decision, except for what Trump had seen on the TV shows. 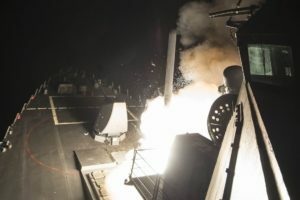 A similar event had occurred on Aug. 21, 2013, outside Damascus – and although the available evidence now points to a “false-flag” provocation pulled off by the jihadists to trick the West into mounting a full-fledged assault on Assad’s military, Western media still blames that incident on Assad, too. 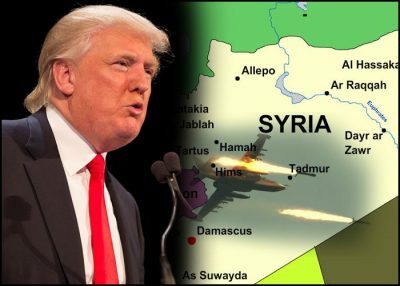 But the Russians (and the Syrians) know what did happen – and if there really was no sarin bombing – they recognize Trump’s reckless resort to Tomahawks and the subsequent attempts to cover up for the President. All this will have repercussions. This is as tense a time in U.S-Russian relations as I can remember from my five decades of experience watching Russian defense and foreign policy. It is left to the Russians to figure out which is worse: a President controlled by “his generals” or one who is so out of control that “his generals” are the ones who must restrain him. With Russia reiterating its threat to target any unannounced aircraft flying in Syrian airspace west of the Euphrates, Russian President Putin could authorize his own generals to shoot first and ask questions later. Then, hold onto your hat. As of this writing, there is no sign in “mainstream media” of any reporting on Hersh’s groundbreaking piece. It is a commentary on the conformist nature of today’s Western media that an alternative analysis challenging the conventional wisdom – even when produced by a prominent journalist like Sy Hersh – faces such trouble finding a place to publish. The mainstream hatred of Assad and Putin has reached such extraordinary levels that pretty much anything can be said or written about them with few if any politicians or journalists daring to express doubts regardless of how shaky the evidence is. Even the London Review of Books, which published Hersh’s earlier debunking of the Aug. 21, 2013 sarin-gas incident, wouldn’t go off onto the limb this time despite having paid for his investigation. According to Hersh, the LRB did not want to be “vulnerable to criticism for seeming to take the view of the Syrian and Russia governments when it came to the April 4 bombing in Khan Sheikhoun.” So much for diversity of thought in today’s West. Yet, what was interesting about the Khan Sheikhoun case is that was a test of whom the mainstream media detested more. The MSM has taken the position that pretty much whatever Trump says is untrue or at least deserving of intense fact-checking. But the MSM also believes whatever attacks on Assad that the Syrian “activists” post on social media are true and disbelieves whatever Putin says. So, this was a tug-of-war on which prejudices were stronger – and it turned out that the antipathy toward Syria and Russia is more powerful than the distrust of Trump. The MSM bought into Trump’s narrative to such a degree that any criticism, no matter how credentialed the critic, gets either ignored or ridiculed. For instance, the Veteran Intelligence Professionals for Sanity produced a memo on April 11 questioning Trump’s rush to judgment. Former MIT professor Ted Postol, a specialist in applying science to national security incidents, also poked major holes in the narrative of a government sarin attack. But the MSM silence was deafening. But it may be that the Germans reading Welt am Sonntag may be among the few who will get the benefit of Hersh’s contrarian view of the April 4 incident in Khan Sheikhoun. Perhaps they will begin to wonder why Chancellor Angela Merkel continues with her “me-too” approach to whatever Washington wants to do regarding tensions with Russia and warfare in Syria. 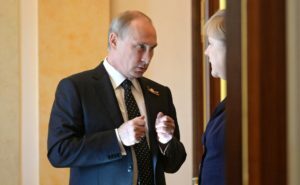 Will Merkel admit that she was likely deceived in parroting Washington’s line making the Syrian government responsible for a “massacre with chemical weapons” on April 4? 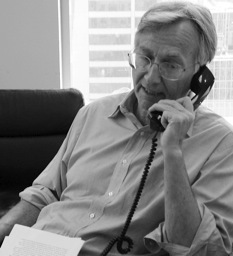 Mercifully, most Americans will be spared having to choose between believing President Trump and Seymour Hersh. Ray McGovern works with the publishing arm of the ecumenical Church of the Saviour in inner-city Washington. During his 27 years as a CIA analyst, he was Chief of the Soviet Foreign Policy Branch; he also prepared the President’s Daily Brief, and conducted the early morning briefings of President Reagan’s top national security advisers.